AKA. STOP PINNING THOSE BLOODY THINGS ON PINTEREST!! You know that these are designed for children? Helping them develop their vocabulary and learn the rules of working with the English language. In the weird paradox that is our education system, we teach this, and then we later tell them that it is wrong. When anyone studies writing at a more advanced level, we learn the KISS rule – Keep It Simple, Stupid! If a character has anything to say, then they said it. Occasionally they might shout or exclaim it. But, on the whole, we stick to said. 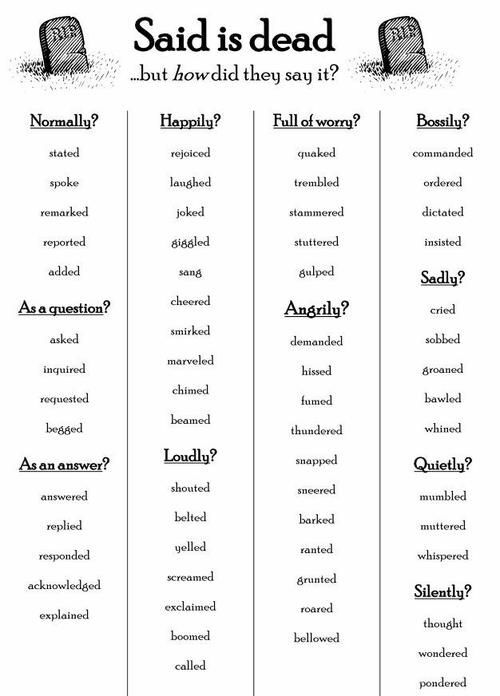 If there is any change in their volume, or the manner in which they said it, you let your writing do the talking – the strength of the words inside the speech marks or the reactions of your characters. Occasionally, you might rely on some well-placed punctuation marks. You do not use the words on these stupid pins. But, for some reason, I keep seeing actual writers, people who write books and short stories and have been published, pinning these damn things. 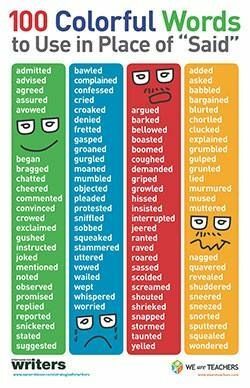 Their argument is that it makes your writing stronger and more concise. And I agree, to an extent. Bellowed is a much stronger word than shouted. Ejaculated is just wrong, unless you write smutty novels. “It is not appropriate for a young woman to wear such clothing,” sermonised Mr Hartley. “Actually, I don’t mind it,” contributed Mr Westfeld. In this scene, we can infer a lot about the characters based on the dialogue tags. Sermonised suggests Mr Hartley may be a man of the cloth, or he just acts like one, being prone to moralistic judgements and correcting the behaviours of others. Contributed implies Mr Westfeld is probably sitting to the edge of the conversation, but is not so afraid of Mr Hartley that he would not offer his own viewpoint on the matter. But what if you really just want to raise or lower the volume? I’m probably going to get tarred and feathered by the writing community for this, but if you really need to modify a word, then use an adverb. That’s what they are designed for. Just watch out for redundancy. Only idiots have shouted loudly or whispered quietly. “It is not appropriate for a young woman to wear such clothing,” said Mr Hartley, with a tone that reminded her of the Reverend. There would be an end to the trousers, she was sure. “Actually, I don’t mind it,” said Mr Westfeld, only a second faster than the continuation of Hartley’s lecture. As for making your writing concise? I think they’ve misunderstood the concept. There is nothing more to the point than said. Said works so well because the modern reader can filter it out of their active reading, allowing the conversation to continue as if it were actually taking place in front of them, like a movie. Adding some horrible dialogue tag interrupts this flow, and forces the reader to re-read it, inserting an emphasis that may not necessarily be needed. Said is not dead. It is very much alive, and disgusted at the attitude of some people on Pinterest. Do you agree? Or do you think I just “reported” utter crap or “blurted” some trash? What is the worst writing advice you keep hearing? Leave a comment below. This is the first post of my Writing Wednesday series. 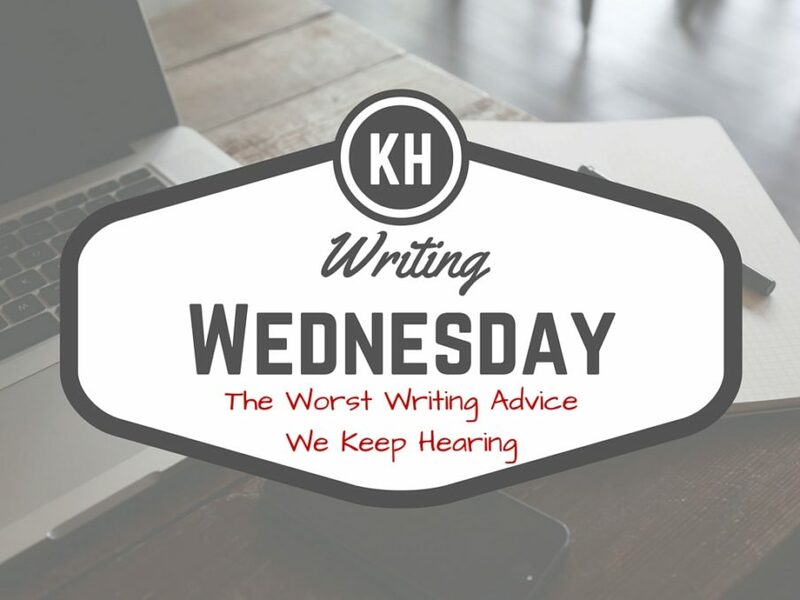 On the last Wednesday of every month I’ll be sharing some advice for writers. Follow me on social media to stay up to date.